Having a solid and effective resume can greatly improve your chances of landing that dream job. That is beyond discussion. How does one make sure that his resume is top notch and bullet proof, however? There are several websites with tips around the web, but most bring just a handful of them. We wanted to put them all together in a single place, and that is what you will find below: 44 resume writing tips to guide you in creating a resume. Instead of creating a long (and boring) list with all your qualities (e.g., disciplined, creative, problem solver), try to connect them with real life and work experiences. In other words, you need to back these qualities and strengths up with relevant skills/experience; else it will appear that you are just trying to inflate things. Most companies (even smaller ones) are already using digital databases to search for candidates. This means that the HR department will run search queries based on specific keywords. Guess what, if your resume doesn't have the keywords related to the job you are applying for, you will be out even before the game starts. These keywords will usually be nouns. Check the job description and related job ads for a clue on what the employer might be looking for. You can read more about resume keywords in the article 'Tapping the Power of Keywords to Enhance Your Resume's Effectiveness'. Like it or not, employers will usually make a judgment about your resume in 5 seconds. Under this time frame the most important aspect will be the titles that you listed on the resume, so make sure they grab the attention. Try to be as descriptive as possible, giving the employer a good idea about the nature of your past work experiences. It would be difficult to emphasize the importance of proofreading your resume. One small typo and your chances of getting hired could slip. Proofreading it once is not enough, so do it twice, three times or as many as necessary. If you don't know how to proofread effectively, here are 8 tips that you can use. Including professional goals can help you by giving employers an idea of where you are going, and how you want to arrive there. You don't need to have a special section devoted to your professional objectives, but overall the resume must communicate it. The question of whether or not to highlight your career objectives on the resume is a polemic one among HR managers, so go with your feeling. If you decide to list them, make sure they are not generic. points is probably safer. Do not use capital letters all over the place; remember that your goal is to communicate a message as fast and as clearly as possible. Arial and Times are good choices. There are many people that like to include statements like "Available for interview" or "References available upon request." If you are sending a resume to a company, it should be a given that you are available for an interview and that you will provide references if requested. Just avoid items that will make the employer think "no kidding!" Do not include information that might sound negative in the eyes of the employer. This is valid both to your resume and to interviews. You don't need to include, for instance, things that you hated about your last company. Resumes that include a long list of "responsibilities included..." are plain boring, and not efficient in selling yourself. Instead of listing responsibilities, therefore, describe your professional achievements. This tip is a complement to the 13th one. If you are going to describe your past professional achievements, it would be a good idea to make them as solid as possible. Numbers are your friends here. Don't merely mention that you increased the annual revenues of your division; say that you increased them by $100,000, by 78%, and so on. If you never had any real working experience, just include your summer jobs or volunteer work. If you don't have a degree yet, mention the title and the estimated date for completion. As long as those points truthful and relevant to the job in question, it does not matter if they are official or not. Remember that you are trying to sell yourself. As long as you don't go over the edge, all the marketing efforts that you can put in your resume (in its content, design, delivery method and so on) will give you an advantage over the other candidates. If you have a gender neutral name like Alex or Ryan make sure to include the appropriate prefix (Mr. or Ms.), so that employers will not get confused about your gender. Seems like a no brainer, but you would be amused to discover the amount of people that lie in their resumes. Even small lies should be avoided. Apart from being wrong, most HR departments do background checks these days, and if you are busted it might ruin your credibility for good. Even if you think your resume looks good, it would be a wise to get a second and third opinion about it. We usually become blind to our own mistakes or way of reasoning, so another person will be in a good position to evaluate the overall quality of your resume and make appropriate suggestions. The ideal length for a resume is a polemic subject. Most employers and recruiting specialists, however, say that it should be limited to one page, or two pages at maximum. Just keep in mind that, provided all the necessary information is there, the shorter your resume, the better. Very common advice to job seekers is to use action verbs. But what are they? Action verbs are basically verbs that will get noticed more easily, and that will clearly communicate what your experience or achievements are. Examples include verbs like: managed, coached, enforced and planned. Unless you are 100% sure that some of your hobbies will support your candidacy, avoid mentioning them. I know you are proud of your swimming team, but share it with your friends and not with potential employers. If you have reported or worked with someone that is well known in your industry, it could be a good idea to mention it on the resume or cover letter. The same thing applies to presidents and CEOs. If you reported to or worked directly with highly ranked executives, add it to the resume. Your resume must have a clear focus. It would cause a negative impression if you mentioned that one year you were studying drama, and the next you were working as an accountant. Make sure that all the information you will include will work towards a unified image. Employers like decided people. There are many websites that offer free resume templates. While they can help you to get an idea of what you are looking for, do not just copy and paste one of the most used ones. You certainly don't want to look just like any other candidate, do you? Do not use a colored background, fancy fonts or images on your resume. Sure, you might think that the little flowers will cheer up the document, but other people might just throw it away on sight. 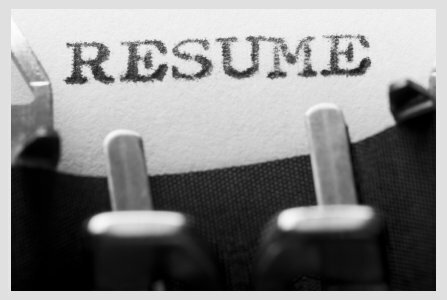 You resume should not contain the pronouns "I" or "me." That is how we normally structure sentences, but since your resume is a document about your person, using these pronouns is actually redundant. The first thing on your resume should be your name. It should be bold and with a larger font than the rest of the text. Make sure that your contact details are clearly listed. Secondly, both the name and contact details should be included on both pages of the resume (if you have more than one). If you are having a hard time creating your resume, or if you are receiving no response whatsoever from companies, you could consider hiring a professional resume writing service. There are both local and online options are available, and usually the investment will be worth the money.